Back in March I talked about entering the computer market. Jessi's computer had just crashed and she didn't want to replace the hard drive for a third time. Furthermore, we had always dream of one day switching to Mac. 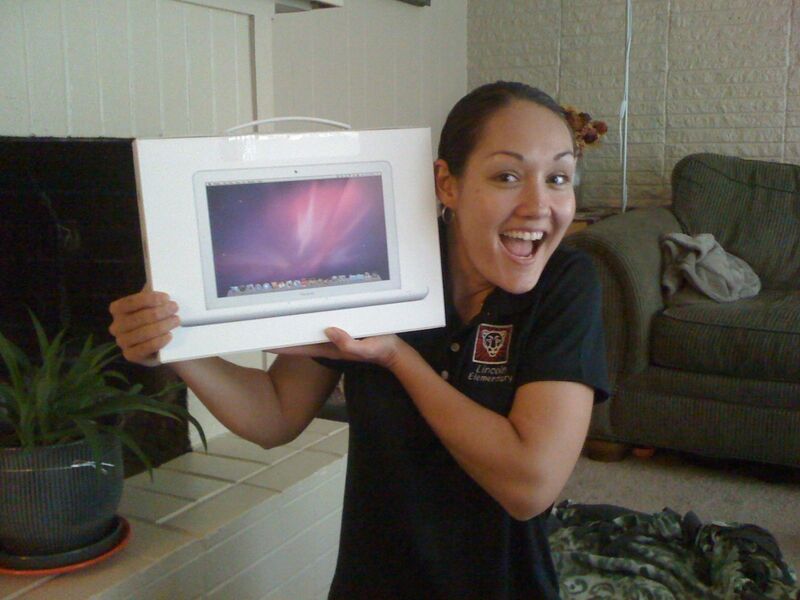 I grew up using Macs and Jessi loves her iPhone - it seemed to make sense. The original plan was for me to buy a Mac Mini because I already owned a mouse, keyboard & monitor. 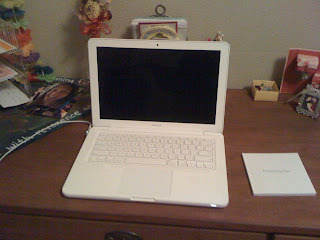 Then Jessi could use my current laptop until we saved up enough to get her a new computer some time in the future. Funny how plans work out. In the mean time, we still had to save for the Mini. So, we decided to share my laptop. A laptop, which actually gets used like a desktop: I had an external monitor, keyboard, mouse, webcam, hard drive and a printer hooked up to it. For the amount of time I spent on my computer, I had decided it was worth investing in better hardware to make using it more comfortable. The only downside was the loss of mobility, but after I graduated school my computer hadn't moved anyways. Anyways, there we were: sharing an older computer. This went as you might expect. My laptop slowed down to a crawl and we constantly gave each other the [loving] stink eye when we came into the office it find it already in use. Then, things really went downhill: The power brick failed. I don't know why it broke. I hadn't moved the computer in a very long time, but it did. The place where the cord and the brick connect would start sparking and the monitor would flicker. Yeah, not great for many reasons. Jessi made a quick fix that involved blue painter's tap, but was still a fire hazard. So, here we are: down one computer with another one quickly fading. I still have my work computer, but I'm pretty sure they wouldn't want me sharing it with Jessi. At this point, we had only been half-heartily saving. I wanted a new computer, but we had always found other excellent things to spend our money on (lots of camping and trips). This time round we got serious. On one of our trips up to Portland we stopped by the Apple Store to see what our options where. I went in thinking I would get a Mini and Jessi might be interested in the iPad, whiling syncing her files on the Mini. I think we spent 45 minutes of the sales person's time debating over what would be the best solution given our needs. When it was all done, we decide the best options were a MacBook for Jessi and an iMac for me. Jessi wanted portability, the ability to check email/calendar/facebook, do general web surfing, watch Hulu/Netflix (including the DVDs), and write the occasional document. The iPad actually came at a close second, but Jessi also didn't want to manager her files on my computer and feel like she had to ask permission to get on my computer. I don't blame her. I wanted to do everything Jessi wanted, plus make complicated spreadsheets, play games, program for the web/iOS, and have plenty of storage (having an external drive as your main drive isn't fun). I needed to increase a few of the specks on the Mini to get everything I wanted. For a couple hundred more, I could get all of it with the iMac. Since it already came with a monitor, webcam, keyboard & mouse, I could sell all my accessories and maybe even come out ahead (I didn't, I just repurposed everything, as you can see in the picture). When we used Windows machines, Jessi would ask me a question and I knew the answer. Often I didn't even have to look at the screen to tell her what to do. However, whenever she asks me how to do something on her Mac, I honestly don't know. 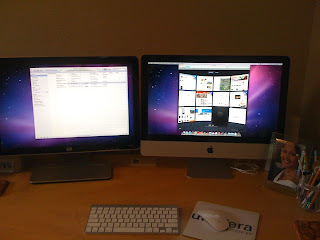 However, and this is what makes Macs so awesome, my answer has been a question back: "How do you think it should work?" Jessi would tell me, and I'd say to give it a try. In EVERY SINGLE CASE, it as worked exactly the way Jessi wanted it to. Here's a simple example: We wanted to play our Netflix DVD. Jessi asked me how to do that, to which I gave my question back. Jessi said, "I want to put the DVD in and have it start playing." I told her that sounded reasonable and give it a try. She put the DVD in and... wait for it... the movie started playing right away! I half expected to see a window popping up asking to play, but nope, it work exactly how Jessi wanted it to. This is one of many examples (setting our our wireless HP printer was 1,000 times easier than on my HP work laptop!). It's obvious that Apple spends a significant amount of time watching how customers use their computers and then make changes to fit their customers. 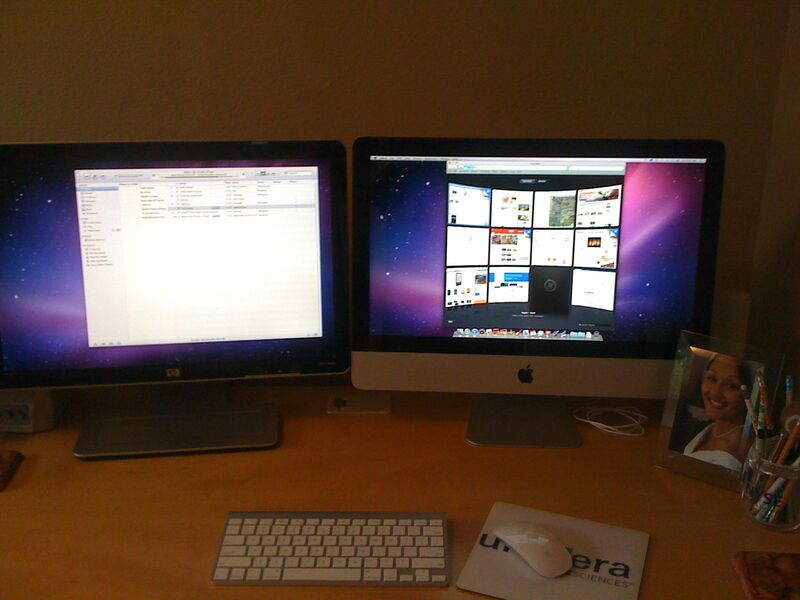 So, we're now living in the Mac ecosystem and loving it. Given the amount of time we spend on our computers, it made sense to get something that we would both be happy with - and we are both really happy. Personally, I'm really excited to start diving into the iOS SDK and make a couple fun apps for my iPhone. One last thought: I now find myself in another strange position. On October 20th Apple will be holding a special event to talk about new things for Mac. I find myself excited about what they have to share, but also hoping it's not too crazy so I don't feel like I have something super old. It'll be fine no matter what. I'm still glad we are in the Mac ecosystem even if it is a little out of date. I mean, I still have a 3G iPhone and it still works just fine.